In an earlier article I discussed what Apistan is – a pyrethroid miticide – and the consequences of using it. These include decimation of the mite population if it is susceptible, coupled with the accumulation of long lasting residues in wax. These residues may adversely effect queen and drone development. I also discussed ways to avoid build-up of Apistan residues in comb. The key phrase in the paragraph above is ‘if it is susceptible’. Unfortunately, resistance to Apistan and the related tau-fluvalinates develops very quickly. To understand why we’ll need to look in a little more detail at how Apistan and other pyrethroids work. Apistan, like other pyrethroids, works by blocking the activity of voltage gated sodium channels (VGSC) resulting in paralysis because the axonal membrane cannot repolarise. 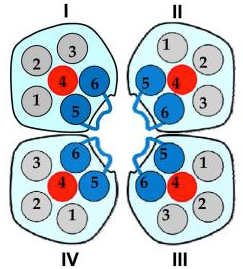 Nerve transmissions – like the signal from the Varroa brain to tell the Varroa legs to move – travel along axons. These are usually very long thin cells. In the adjacent image the ‘brain’ is on the left and the leg muscles on the ‘right’. The nerve impulse (the moving arrow) travels down the axon ‘driven’ by a change in polarity (charge) across the membrane of the axon. In the resting state, when there is no impulse, this is positively charged on the outside and negatively charged on the inside. Sodium – remember the ‘S’ in the acronym VGSC – is positively charged and crosses the membrane (out to in) via a small pore or hole as the impulse passes. This makes the inside of the axon transiently positive†. The pore or hole is the VGSC. The VGSC is a transmembrane protein. 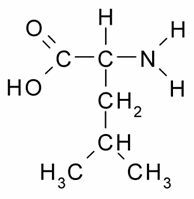 It actually crosses the membrane multiple times and assembles to form a very narrow channel through which the sodium passes. The cartoon on the right shows the top view of a VGSC, looking “down” the pore into the inside of the axon. The blue bits can move to open or close the pore, allowing sodium to traverse – or not – the membrane into the axon. Apistan binds to the transmembrane protein and prevents the pore from closing. As a consequence, sodium continues to pass from the outside to the inside of the axon, the nerve cannot repolarise and no further impulses can be transmitted. As a consequence, Apistan paralyses the Varroa. Why isn’t the beekeeper paralysed as well? Nerve impulses in Varroa and humans are transmitted in essentially the same way. We also have VGSC’s that operate in a similar manner. Why doesn’t Apistan also paralyse careless beekeepers? More generally, why are pyrethroids the most widely used insecticides, available in all garden centres and supermarkets? Two factors are at work here. The first is the specificity of binding. The VGSC is a protein. Proteins are made from building blocks termed amino acids. The precise sequence, or order, of amino acids is usually critical for protein function. However, two proteins with a similar function can exhibit differences in the amino acid sequence. Although the human and mite VGSC have a similar function they have a different amino acid sequence. Apistan binds much better to the mite VGSC than the human VGSC (this also explains why bees aren’t also paralysed by Apistan … the miticide is specific for the mite VGSC and binds poorly to the honey bee VGSC). In addition, many mammalian species have a number of detoxifying enzymes which deactivate pyrethroids, rendering them ineffective. Together, this explains the specificity of Apistan and other pyrethroids, and the low level of toxicity to humans. Unfortunately, usually not. Since the late-1990’s there have been a large number of publications of Apistan- or fluvalinate-resistant mites from many countries, including the USA (1998, 2002), Israel (2000), UK (2002), Spain (2006), Korea (2009) and Poland (2012). The National Bee Unit used to report Varroa resistance test results by geographic region in England and Wales. Resistance was first reported in mites from Cornwall and Devon (in 2001 and 2002). By 2006 resistance was very widely distributed throughout England. By then approximately a third of all mite samples tested were resistant. The number of tests conducted (or at least reported) then dwindled and there have been none reported since 2010. Not no resistance … no tests. Presumably it’s no longer worth reporting as resistance is so widespread. The most up-to-date map on the distribution of Apistan resistance I could find is in the NBU booklet on Managing Varroa [PDF; page 28 of the 2015 edition], though the data presented is from 2009. 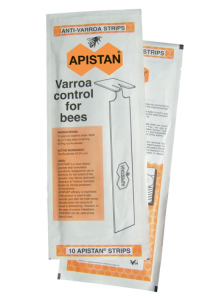 However, bee equipment suppliers continue to sell Apistan (even Vita, the manufacturer, states that resistance is widespread) and beekeepers continue to use it. Many do so without first testing whether the mite population in their colonies is sensitive to the miticide. How should this be done? Vita suggest two tests. Their first (the “rule of thumb test”) is deeply flawed in my view. It suggests simply looking for a drop of 100’s of mites in the first 24 hours after treatment starts as indicative of a sensitive population. This isn’t good enough. What if there were thousands of mites present? Perhaps 20% of the population are sensitive, with the remainder resistant‡. 20% of 5000 mites is 1000 … so you might expect a drop of 100-200 (the majority of the phoretic population) within the first 24 hours. Some might consider this drop indicates a sensitive population … it doesn’t. It’s not sufficient to count the corpses … you need to know how many mites were unaffected by the treatment. The second Vita-recommended test is a cut-down version of the “Beltsville” pyrethroid resistance test which is fully described in an NBU pamphlet (PDF). This is much more thorough. Essentially this treats ~300 bees with Apistan, counts the mites that are killed in 24 hours and then counts the unaffected mites remaining on the bees. It’s only by knowing the total number of mites at the start and by determining the percentage of mites sensitive that you can be sure that the treatment is effective. What is the molecular basis of resistance? We’re almost there … specific pyrethroids, like Apistan, bind to specific parts of the VGSC. The VGSC is a protein made up of a long connecting chain of amino acids. The binding of the pyrethroid requires an interaction with a small number of specific amino acids in the VGSC. If these particular amino acids change – through mutation for example – then the pyrethroid will no longer bind. If the pyrethroid does not bind the VGSC can open and close again, so the axon repolarises and the mite is not paralysed. The mite is resistant and can then go on to rear lots more resistant baby mites … which, in due course, transfer the viruses that kill your bees. A single mutation that causes a substitution of amino acid number 925 in the Varroa VGSC, which is usually a leucine, to either a valine, a methionine or an isoleucine, is sufficient to prevent Apistan and other tau-fluvalinates from binding. At least 98% of mites resistant to Apistan have one of these substitutions. Apistan resistant mites with substitutions at position 925 have been found in the UK, eastern Europe and several sites in South-Eastern USA. It wouldn’t be surprising if the remaining ~2% of resistant mites had a mutation at one of the other amino acids involved in pyrethroid binding. Further studies will confirm this (there are alternative mechanisms that cause resistance, but the one described here is the most frequently seen). Why aren’t all Varroa mites resistant to tau-fluvalinates? Apistan resistance has clearly been demonstrated for the last two decades. Resistance is easy to acquire and selection – in the presence of the pyrethroid – is effectively absolute. Without the necessary mutation the mites die, with the mutation they survive. Bees – and the phoretic mites that are associated with them – are moved around the place all the time, by migratory beekeepers, by importers and through robbing and drifting between colonies. Why therefore aren’t all Varroa mites now resistant to Apistan and other tau-fluvalinates? The answer to that is interesting and suggests strategies that could make Apistan an effective treatment again … but I’ll save that for another time. † Only transiently as the charge is reversed shortly afterwards by a similar, though not identical, mechanism that does not use the VGSC. However, life is simply too short to describe this bit as it’s not needed to understand pyrethroid – or Apistan – activity and resistance. ‡ The incestuous life cycle of the Varroa mite is important here. This post is already too long to fully elaborate on this but the size of the mite population relative to available open brood (and whether you get single or multiple occupancy of cells) will likely influence the proportion of resistant, partially resistant and sensitive mites in a population. Credits – the action potential GIF was created by Laurentaylorj from Wikipedia. This entry was posted in Beekeeping, Responsibility, Varroa control and tagged Apistan, Bayvarol, DWV, fluvalinates, miticides, pyrethroid, resistance, Varroa, voltage gated sodium channel on March 10, 2017 by David. Thanks Mike … slight delay to part three as I’ve been overtaken by events and instead have written some things about swarming. Please don’t forget to write part three when you get time interesting thanks. 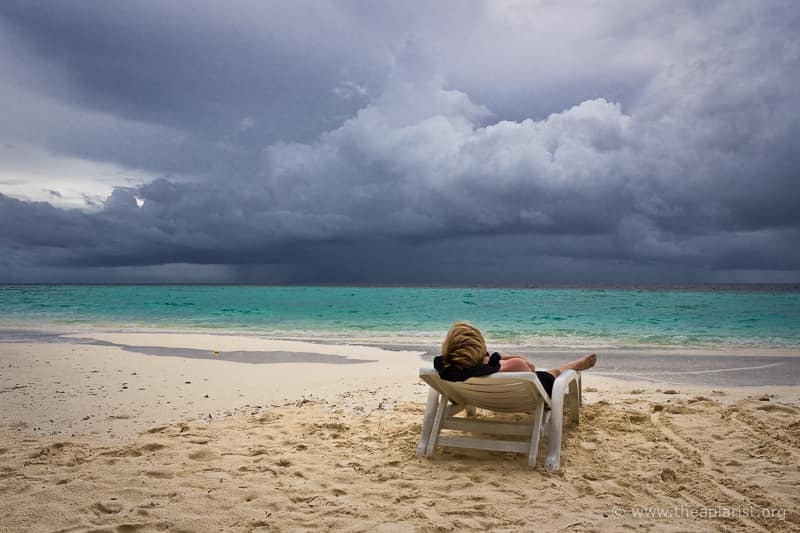 I’m delayed by the pesky problem of full-time employment and a fortnight working in Chile. When posted it will be linked from this page and from my general overview of Varroa treatments. Great, and best of luck with the lecture in Wales. Thank you so much for your really informative posts. I share them on my association (South Gloucestershire Beekeepers (SGBKA)) Facebook page and are seen regularly by 30+ members. We look forward to your adventures and observations. Happy for your to share a link to the post. Pleased you enjoy them.